Moving site from http to https results in much lower earnings. As you may have noticed on our recent blog post on How to move WordPress site over to HTTPS, Crunchify moved over to HTTPS and enabled OV (Organization Validation) Certificate everywhere. It took some significant amount of time for this HTTPS migration. It went perfectly smooth without any issue. After couple of days, I started noticing little around ~10% less revenue on my Adsense account. With more than ~16 millions visits per month, ~10% revenue loss is significant and that’s not good. 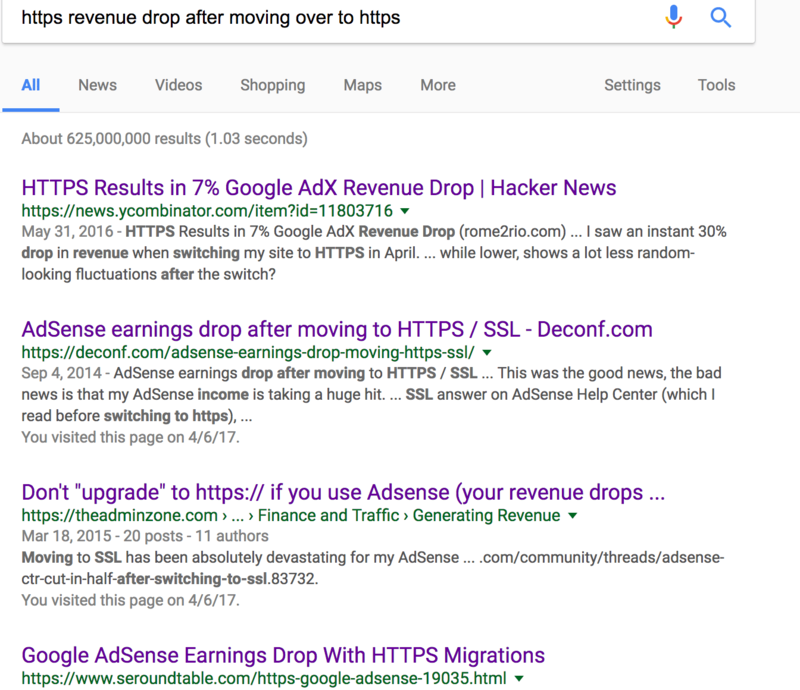 There are definitely lot advantages moving over to HTTPS but so far I’ve seen little search result ranking boost with it but AdSense earnings seem to have taken a hit little-bit. Does Switching to HTTPS affect AdSense Revenue? Take a look at below image, I started searching for similar issue and that’s not only me but so many other folks have reported the same issue. I did little more digging and seems, not all ads are serving over HTTPs yet and hence lower bidding on ad slots are causing this impact. There isn’t any official comment we have heard from Google but I believe, hopefully they address this issue soon. Some larger publishers also noticed up to ~25% revenue drops after moving WordPress site over to HTTPs. We will enable SSL again in couple of months to perform more test. Please stay tuned and let us know if you have any other observation after moving WordPress site over to HTTPs. Take a look at similar conversion at official Google Adsense forum.